An introduction to several types of experimentation, Raman scattering, fluorescence, and transmission/reflection spectroscopy using a grating spectrometer is provided through these experiments. A grating spectrometer is useful from the hard ultraviolet (~ 100 nm) to the far infrared (~ 1 mm), spanning a range of order 10^4 in frequency or wavelength. A modern revolution for measurement has come about with the introduction of diode arrays or CCD (charge coupled device) detectors. 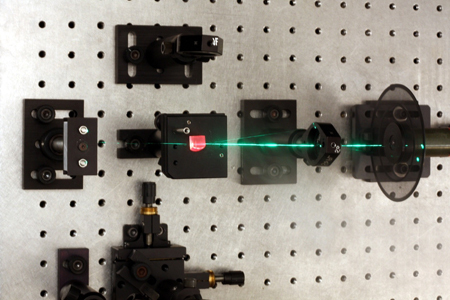 In this case, an array of “photodiodes” or photosensitive pixels is placed in the focal plane of the spectrometer and exposed. The current CCD has silicon pixels and responds to wavelengths from UV to 1 micron. The CCD is cooled as dark nois is substantial at room temperature. Each pixel can have the sensitivity to detect only a few photons per second. The advantage is the high sensitivity and the rapid readout mitigated by computer driven electronics, so that a strong spectrum can be recorded in a few milliseconds, while a weak spectrum can be integrated up for long periods of time (hours) before read-out. In this experiment we use a CCD with 1024 pixels in the horizontal plane, i.e. the plane in which the radiation is dispersed. The CCD is controlled with a LabView program. Optical setup for studying ruby fluorescence. 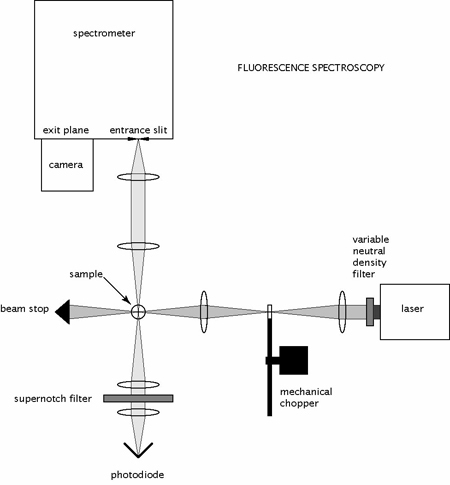 Optical spectroscopy is a major tool both in research and industry for characterizing materials, and has grown in use with the development of cooled state-of-the-art CCD detectors and grating spectrometers. CCDs have greatly increased the sensitivity and speed of measurements and discovery in modern research studies of gases, liquids, and solids. This experiment not only provides experience in various types of optical spectroscopy, but one also learns the advantages and limitations of modern optical detectors.